Researchers at Lancaster University have created a wrist device that can tell a person how long they will live. This optimistic little device is called the "Endotheliometer," and in their own words, it's "the thermometer of the 21st century." 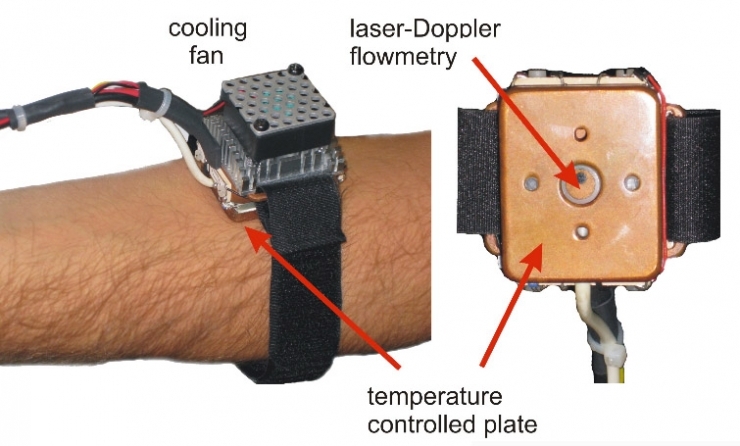 This non-invasive device is mounted on your wrist, and measures activity within the entothelium, a layer of cells that coat the inside of your blood vessels. Using LDF (Laser Doppler Flowmetry), it analyses cardiac-induced pulse waves, that reveal endothelial activity. The less this activity is, the less time you have, as some believe this direct correlation can determine the longevity of a life. The researchers, based at Lancaster University in the U.K., claim that their "Endotheliometer"could become "the thermometer of the 21st century." The non-invasive, wrist-mounted device measures the activity within the layer of cells known as endothelium that coat the insides of your body's blood vessels. The device conducts the analysis by detecting cardiac-induced pulse waves in the skin's microcirculation using LDF (laser Doppler flowmetry). Because endothelial activity declines as our bodies age, some believe the device could be used to determine the relative longevity of a person. "Endothelial function declines with age, and diseases such as heart failure and hypertension have associated endothelial dysfunction," Professor Aneta Stefanovska, one of the developers commented in a statement. "We can use it to check that the state of ageing is within healthy limits and can try to prevent possible complications leading to serious impairment and cardiovascular disease." Check out the research behind the device here.